The latest edition of Healing is a Choice: 10 Decisions That Will Transform Your Life and 10 Lies That Can Prevent You From Making Them is an excellent 10-step emotional healing program that has been revised to include a full workbook. It emphasizes that healing is a choice. First, it is God's choice. Second, it is the choice of the one needing to be healed. He reveals how emotionally injured people tend to hide away their hurting and hinder their own acceptance of God's healing. 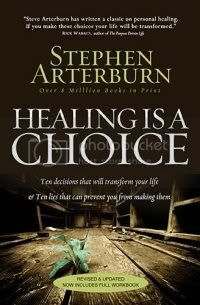 The author, Stephen Arterburn, has an amazing style of writing for this type of book. He is not condescending at all. Rather, he reveals his own vulnerability and draws the reader in with a simple use of the English language. I nearly felt as if I was in a room being gently but firmly counseled by him. I found it to be very encouraging. The author presents each of the ten steps as a choice to heal and to dispel myths along the way. Also emphasized is the need to make connections with other people while going through the healing process. He strongly suggests several times that having support is essential and the book is not a self-help program to do on one's own. As such, it is an excellent book for using in a small support group. I was hoping this book would include more on physical healing, but it merely touched on the subject here and then more as a result of emotional healing, which does happen to some degree. On this issue I was a bit disappointed, but I plan to use this book in a woman's support group study that I hope to start this year.